How is the UK HE Sector Using YouTube? Following on from recent posts on Planet Facebook Becomes Less of a Walled Garden and What Are UK Universities Doing With iTunesU? the next question should be How is the UK HE Sector Using YouTube? It can be useful for the higher education sector to be able to identify institutional adoption of new services at an early stage so that institutions across the sector are aware of trends and can develop plans to exploit new dissemination channels once the benefits have been demonstrated. I am aware, for example, of failures of institutions to sport the ‘weak signals’ of the importance of the Web in the early 1990s. I have recollections of institutions committing themselves to locally-developed Campus Wide Information Systems (as they were called) or moving to use of Gopher (an Internet technology which was felt to provide benefits of openness which were eventually materials, though with an alternative Internet standard!) but failing to respond to decisions of a small number of institutions who adopted Web technologies in around 1993. Adopting the wrong technologies will, in hindsight, be seen to have been a costly mistake, not just for the individual institutions but also, as we are now very aware of, the tax-payer who ultimately pays for the decisions institutions take. This recent series of posts therefore aims to identify technologies which are starting to be adopted by institutions, so that we can have a snapshot of how such services are being used. Such an understanding of the trends within the sector can help to inform decision-making, sharing of best practices and also ways in which the return on investment use of new approaches can provide. Such information will be of importance in demonstrating the value of the decisions the sector makes to politicians, policy makers and the general public. 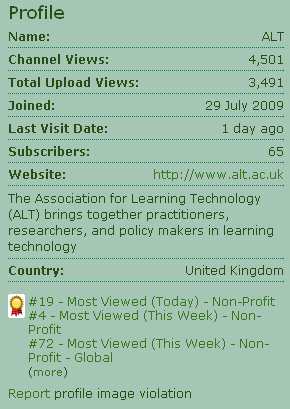 At the time of writing (7 October 2010) there are 10 video clips from the ALT-C 2010 conference hosted on this channel, the most popular being the ALT-C 2010 Sugata Mitra (457 views) followed by ALT-C 2010 Donald Clark (320 views). In addition to the ALT-C 2010 playlist the channel also has playlists for ALT-C 2009, ALT – EPIGEUM Video Awards and ALT-C 2008. YouTube provide various metrics for channels, including information on the numbers of views of the video clips and numbers of subscribers. In addition, as can be seen in the accompanying image, ranking information is provided, and we can see that the ALT channel is the fourth most viewed non-profit channel in the UK of the week. You can also view details of the traffic rankings for the various YouTube categories, which indicates that theRSAorg, practicalaction and royalbritishlegion channels had the highest viewing figures for the week in which I captured the statistics. The lists of YouTube categories unfortunately doesn’t include Universities, instead having the following rather eclectic lists: Comedians, Directors, Gurus, Musicians, Non-Profit, Partners, Reporters and Sponsors. I therefore had to use YouTube’s search facility in order to identify how UK Universities are using YouTube. Note, however, that I was subsequently informed that there is a directory of University accounts on YouTube Edu. I have commented on this directory at the end of this post. A search for “UK university” revealed the Bath University (my host institution) is in first place with a video in which “Jojo Mayer performs a Masterclass at the Rhythm Course at Bath University” – there have been 199,331 views of this video clip since it was uploaded 3 years ago. There is a need, however, to be suspicious of searches which reveals that your particular interests are to be found near the top – I suspected that this result reflected my location or profile, although others based elsewhere had similar findings. Another nearby university, Bristol University, is found in second place. This example, “Bristol University, UK – Study at Bristol – An introduction to one of the very best and most exclusive” has been provided by the official unibristol YouTube account and there have been 18,025 views. This was the first official University page I found. I have looked through the search results looking for what appear to be official university accounts. I have excluded individual’s clips about universities and also channels such as TOEFL Destinations: University of Northampton which aren’t about a specific university, although I have included what appears to be departmental accounts if they appear to have an institutional user name. Note that the results given in the following table were found in the first five pages of results for a search for “UK University” – note that many of the results were for the University of Kentucky, which has the abbreviation ‘UK University’! Note that ‘Channel views’ is the number of users who have visited a channel page (which contains information about the channel) and the ‘Upload views’ is the total number of views for uploaded videos. Although I have tried to provide a list based on an objective criterion, I feel it would also be useful if I included details for the University of Bath, my host institution and the Open University, which I know is a significant institutional user of a variety of Web 2.0 services (note that the Open University has three additional official institutional YouTube channels: OU Learn, OU Life and OU Research). After writing the first draft of this post I realised that it would be useful to find ways of automatically obtaining statistics of institutional use of YouTube across UK Universities. I asked for suggestions on ways of doing this on the Quora question and answer service and received a response for YouTube which provided information on the directory of accounts on the YouTube Edu service. As this directory provides different information from that listed above (the University of Bath account, for example, isn’t included) I have left the details I collected in the above table. Let’s now summarize the usage statistics for this official list of UK University accounts on YouTube Edu. Note, however, that only a single Open University account is included in the following table. 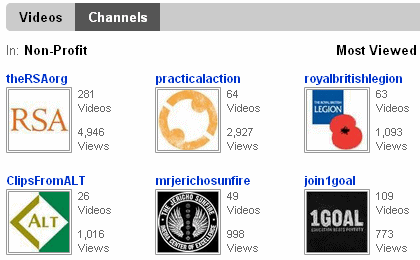 The first institutional YouTube channels seem to have been created in September 2006 (Derby University) followed by Canterbury Christchurch (December 2006). The next set of institutional accounts were created in May 2007 (Huddersfield University), July 20087 (Open University), August 2007 (St Georges and Bath University), October 2007 (Aston University), November 2007 (Coventry) and December (Said Business School). The institution with the largest number of upload views is Cambridge University with 1,189,778 views and Coventry University with 1,039,817 views. Note that such statistics will be skewed in institutions make use of a single institutional YouTube channel or use several (as the Open University does). It should be noted that the Coventry University account, which has the second largest number of downloads, is provided by students. Having more comprehensive data on the provision and usage YouTube across the sector can be useful in informing decision-making on use of YouTube as a delivery channel and how use of YouTube may relate to the institutional provision of video streaming services in-house (such as the LUTube service provided by the University of Leeds). There might also be the need to clarify ownership of an official YouTube Edu account – in some cases the account listed in the YouTube Edu directory is used as an e-learning delivery channel (such as the St. Georges Clinical Skills Online channel, in others as a channel to provide a students’ perspective on University life (e.g. the CovStudent channel) whereas others, such as the University of Edinburgh, provide a more traditional official University view with, as in this case, an official welcome from the University Principal. There may also be the need to share examples of best practices and policies. For example the University of Edinburgh channel states that “Please note, the University does not monitor YouTube comments. Please direct any queries via our website“. Is this a well-established approach and what are the benefits and possible risks of adopting this approach? Anyone have any comments or observations on the initial set of data listed above or thoughts on how the HE sector might make use of YouTube Edu? This entry was posted on 18 Oct 2010 at 9:00 am	and is filed under Evidence, Web2.0. Tagged: YouTube. You can follow any responses to this entry through the RSS 2.0 feed. You can leave a response, or trackback from your own site. You may also want to consider the relationship between departments and institutions re: YouTube channels – the University of Nottingham Chemistry channel has over 10 million video views and their own site at http://www.periodicvideos.com/. These short videos are valuable teaching aids for schools – you can tell they are aimed at schools by the “Is your network blocking YouTube advice” ;-) I can’t track down the reference, but I believe that the year after these videos launched applications to that department increased by 40% – a real impact. For the University of Nottingham channel, it looks as though you’ve confused the figures for subscribers and subscriptions. The channel has 592 subscribers and 120 is the figure for channels that the Nottingham channel has subscribed to. Thanks for pointing out the mistake. This has been corrected. There are also individual university outreach projects using YouTube – we have recently completed a 3 year EU science research project “nano2hybrids” with a large YouTube video blogging component, via our science communication partner the Vega Science Trust (www.vega.org.uk)- the results are either on youtube.com/nano2hybrids or http://www.nano2hybrids.net — it was a big success with around 250,000 video views to date. For example the University of Edinburgh channel states that “Please note, the University does not monitor YouTube comments. Please direct any queries via our website“. Is this a well-established approach and what are the benefits and possible risks of adopting this approach? We do actually carry out light touch monitoring of the queries and comments, but our team is so small it’s not realistic for us to provide a genuinely responsive service. We’re really just trying to mitigate expectations and push them down the most effective route that will get their questions answered. Not ideal but the only manageable option for us.